Sadly, the legendary Patrick McGoohan passed away yesterday, aged 80, after a short illness. 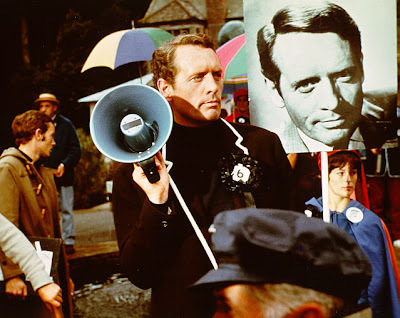 Born March 19, 1928, McGoohan was American but raised in Ireland and England. He had an extensive career in stage, television and film but he will always be known as secret agent John Drake in Danger Man and the instigator of that glorious television conundrum The Prisoner. McGoohan produced and also wrote, directed and starred in the show. He created an enduring phenomenon, rooted in Cold War paranoia, state control and the late 1960s counter-culture. Lasting just 17 episodes, the series continues to defy analysis and interpretation, with the main character's highly symbolic duel with the forces of the state still as relevant and powerful as when the series first transmitted in 1967. After a role in the 1971 film Mary, Queen Of Scots, he didn't reappear until 1974 when he guest starred in an episode of Columbo. The part won him an Emmy Award. He then went on to appear in Silver Streak, with Gene Wilder and Richard Pryor and starred in a new TV series, Rafferty. In 1990 he won a second Emmy for a further guest role in the Columbo series. His last noted appearance was as King Edward Longshanks in the Oscar winning Braveheart. It was long rumoured that he would executive produce a film version of The Prisoner but nothing ever seemed to come of these plans. Recently, ITV and AMC have revived the series for their forthcoming six hour re-imagining. Even so, he remained a single-minded, somewhat volatile man, and will be remembered for his powerful performance in The Prisoner and as a creative powerhouse that defined the Golden Age of television in the 1960s. I think that pretty much sums it up, Rob.